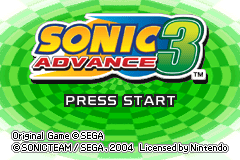 Sonic Advance 3 was meant to be released in June of 2004, but this European prototype was released on March 21st, months before the planned release date. Initially it was dumped on the 16th and distributed among a select few. It's not often a Sega beta is leaked to the public before the games launch date and is a big blunder on Sega's part. The game is near completion but has many bugs, and was in the final bug testing phase. The levels are mostly finished, and you can play any level from startup. Super Sonic is also active and fully functional. TheRedEye, Owner of Lostlevels.org, almost lost his job due to the leak of this prototype. Once the real leaker was discovered, another German magazine employee, his name was cleared and he kept his job. Occasionally a character will become stuck in between a piece of level and be unable to escape. When finishing some levels, the screen will display a blank red screen until the zooming of the text finishes. The main character's partner will sometimes levitate. At the end of the stages they will start their finishing pose before they even land on the ground. Tag actions can be used in the Sonic Factory. If you leave an Act via the Pause menu or get a Game Over while holding a Special Key, you keep the key and you can then use it to enter the Special Stage. In the final, you must complete the Act to keep the key.